What Would the “Big Six” Framework Mean for Lower-Middle Income Households? Tax Policy – What Would the “Big Six” Framework Mean for Lower-Middle Income Households? On Wednesday, Republican leadership released a framework for a tax reform bill. One major question about the framework so far has been about how the plan would impact the tax burden of lower-middle income households. In anticipation of the plan’s release, there was already a great deal of confusion about this question. Initial reports suggested that the plan would include a 12 percent bottom bracket, which would be higher than the current bottom bracket of 10 percent – leading some to speculate that the Republican framework would raise taxes on some lower-middle income households. Even after the framework was released, some questions remained about the effects of the tax plan on the middle class. Advocates of the framework noted that it would nearly double the standard deduction, which would amount to a large middle-class tax cut. Critics of the framework noted that it would also eliminate the personal exemption, which would reduce the benefit of a larger standard deduction. Normally, the way to settle these sorts of disputes would be to model the distributional effects of a full tax plan. However, the Republican framework isn’t detailed enough yet for the Tax Foundation to model. For instance, the framework is still missing information about what income thresholds the 12 percent, 25 percent, and 35 percent brackets would apply to, which is a key piece of information for determining the effects of the entire plan. That said, we can try to isolate the portions of the GOP framework that apply to taxes paid by the lower-middle class. With some assumptions, it’s possible to analyze the impact of this approach. It calls for a larger standard deduction ($12,000 for single filers, $24,000 for married filers), but does not specify the size of the standard deduction for taxpayers who file as heads of household. It calls for the elimination of the personal exemption for both filers and dependents. It calls for the creation of a $500 nonrefundable credit for non-child dependents, as a partial replacement for the personal exemption for non-child dependents. It calls for an increase in the nonrefundable portion of the child tax credit, to an unspecified amount. This is also presumably designed to replace the personal exemption for children. It calls for a 12 percent bottom bracket, up to an unspecified threshold. We can describe this proposal in the following way: it is essentially a proposal to replace the personal exemption and the 10 percent tax bracket with other tax benefits. The portion of the personal exemption that applies to children and other dependents is converted into a larger tax credit for children and a new tax credit for other dependents. The portion of the personal exemption that applies to non-dependent adults is rolled into a larger standard deduction. Finally, the 10 percent bracket is eliminated, and is replaced by increasing the standard deduction even further, as well as lowering the 15 percent bracket to 12 percent. As currently written, the GOP framework is missing a few key details about exactly how these proposals would work. For instance, the framework is silent on how much the child tax credit would be increased, to make up for the elimination of the personal exemption for children. In addition, the framework does not give the size of the standard deduction for taxpayers who file as heads of household. Finally, the framework does not specify how much household income would be subject to the 12 percent bracket. However, we can make some reasonable assumptions about how Republican lawmakers might fill in these details in a tax bill. First, we can assume that the child tax credit would be increased by at least $500, given the creation of a $500 credit for non-child dependents; this was the approach of the House GOP Blueprint from June 2016. Second, we can assume that the standard deduction for heads of household would be about 47 percent larger than the standard deduction for single filers, as under current law; this would amount to a deduction of $17,650. Finally, we can assume that the 12 percent bracket completely replaces the current 10 percent and 15 percent brackets; this too was the approach of the House Blueprint. Increase the standard deduction to $12,000 for single filers, $24,000 for married filers, and $17,650 for heads of household. Allow households to claim a $500 nonrefundable credit for each non-child dependent. Increase the child tax credit to $1,500, with the final $500 nonrefundable. Consolidate the current bottom two income tax brackets into a single tax bracket of 12 percent. Overall, these changes would reduce federal revenue by $209 billion over ten years, on a static basis. Raising the standard deduction, increasing the child tax credit, creating a dependent tax credit, and lowering the 15 percent bracket rate would all reduce federal revenue. To partially offset the cost, eliminating the personal exemption and raising the 10 percent bracket rate would raise federal revenue. The distributional effects of these changes are displayed in the table below. The combination of proposals we modeled would, on average, lower the tax burden on the bottom 80 percent of households, while slightly raising the tax burden on the top 20 percent of households. The group with the largest gains is households between the 60th and 80th percentile, who would see their after-tax income rise by 0.54 percent. Households in the bottom 40 percent would benefit most from the increased standard deduction amount, which would more than make up for the loss of the personal exemption for filers and the increase of the lowest bracket rate. Households between the 40th and 80th percentiles would benefit most from decreasing the 15 percent bracket rate to 12 percent. Notably, the combination of changes we modeled would actually end up raising taxes on households between the 90th and 99th income percentiles. This is because many of these households currently itemize deductions, and would therefore get limited or no benefit from an increase in the standard deduction. Meanwhile, these households would lose the benefit of the personal exemption for filers, leading to a slightly higher tax burden. On the other hand, households in the top 1 percent would see a slight gain from this combination of changes. This is because the highest-income households are already barred from benefiting from the personal exemption under the current tax code, due to a provision known as the “personal exemption phaseout.” As a result, the top 1 percent of households would have less to lose from this combination of changes. Most of the distributional effects in the table above are relatively small. Why would Republican lawmakers be interested in shuffling these provisions for lower-middle income Americans if it didn’t lead to major changes in the distribution of the tax burden? One potential advantage of this approach is that it increases the standard deduction, which would be an important simplification of the federal tax code. Currently, millions of U.S. households go through the process of deciding whether to itemize their deductions each year, requiring a fair amount of recordkeeping, calculations, and compliance with IRS rules. A larger standard deduction would mean that the millions of households would no longer need to determine whether to itemize, making the tax filing process simpler. That said, we still don’t have all the details of what a Republican tax bill would include, so it’s hard to determine the entire impact this approach would ultimately have. Hopefully, lawmakers will fill in the blanks soon. Here, I use “lower-middle income households” loosely to signify households that currently fall in the 10 percent and 15 percent tax brackets. Source: Tax Policy – What Would the “Big Six” Framework Mean for Lower-Middle Income Households? Gross receipts taxes continue to spring up across the country. More than five states have considered the issue just this year; while no state has officially created one, a number of states could revisit that decision in 2018. And now, a local government is getting in on the conversation. The City Council of Carson, California, is asking voters an important question this November: Should the city create a new gross receipts tax to help close the city’s budget gap? If adopted by voters, the city would create a gross receipts tax of 0.25 percent, but unlike a more broadly-applied gross receipts tax, this one would apply only to “any facility where petroleum or petroleum products are blended, mixed, processed, or refined and/or any facility that stores petroleum products.” Carson is home to several oil refineries and pipelines. The city estimates that the new tax would raise $24 million. Instituting this tax would be the wrong approach to closing Carson’s budget gap. The economic distortions created by a gross receipts tax are well-documented. While this would be targeted to only one industry—which could work to limit the pyramiding slightly—petroleum and petroleum products are a necessary input to many other industries. The tax would result in higher input costs for firms, leading to higher final costs for consumers. The proposal does specifically note that it wouldn’t apply to “retail gasoline sales,” but even without that protection, consumers could see higher prices at the pump due to the upstream pyramiding and cost increases. Additionally, the legislative analysis provided to the City Council prior to its vote seems to misunderstand how gross receipts taxes function. The report, in its section discussing the gross receipts tax option, states “they [gross receipts taxes] directly match the ability to pay to the duty to pay as businesses which generate more revenues have greater ability to pay.” This is not obviously true. It ignores a key component, profit margin. Two firms with the same amount of revenue could have vastly different abilities to pay based on their costs. Profit margins vary widely by industry, but also by year. Gross receipts taxes actually punish low-margin firms. Similarly, the tax would hurt firms that are unprofitable. Creating a gross receipts tax, even a targeted one, is a misguided approach to closing the budget deficit for Carson, California. Tax Policy – How High Are Excise Tax Collections Where You Live? Excise taxes are particular taxes levied on specific goods or activities, not general tax bases like income or consumption. Some excise taxes are fairly well-known to the public, like cigarette or alcohol taxes, but others are more hidden, like taxes on admission for amusement businesses. On average, these excise taxes make up a relatively small portion of state and local tax revenue – about 11 percent – but per capita collections vary widely among states. Vermont has the highest state and local collections at $1,068 per capita, followed by Nevada with $910, and Hawaii with $885 in collections per capita. On the other hand, some states collect relatively little per capita in state and local excise taxes. South Carolina collects $317 per capita, Arizona collects $301, and Idaho collects the least in the country with only $292 per capita. It’s important to note that this map uses Census data, which includes taxes on: alcoholic beverages, amusements, insurance, motor fuels, parimutuels (betting), public utilities, tobacco products, and other selective sales. We’ve written extensively about the challenges associated with various excise taxes. Cigarette tax revenue is unstable. The soda tax has serious unintended consequences, particularly as they pertain to health. Most of these excise taxes are regressive. Excise taxes are typically either propped up as a way to either reduce consumption of a good or raise revenue, but these goals contradict each other. Reduced consumption naturally leads to a decline in revenue. Excise taxes are also often touted as a quick way to fill budget shortfalls. However, legislators should fund important policy priorities with broad-based, stable taxes, not narrow and nonneutral tax policy. 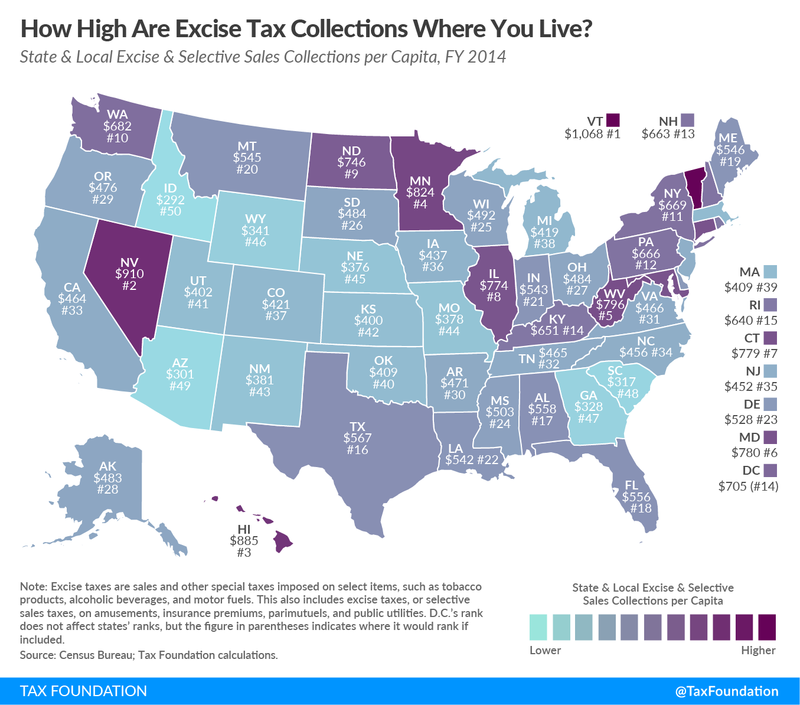 Source: Tax Policy – How High Are Excise Tax Collections Where You Live? Republican leadership released a tax reform framework that calls for fewer individual tax brackets, a lower corporate tax rate, and elimination of many tax deductions. The deduction for state and local taxes paid is taking center stage today as a possible revenue increase for tax reform under the “Big Six” plan. While it’s not specifically enumerated, it is strongly hinted that eliminating this deduction is a central part of the framework. Currently, federal taxpayers are allowed to deduct the greater of their income or sales tax liabilities and their property tax liabilities. Over a 10-year period, the deduction costs $1.8 trillion. After the mortgage interest and charitable giving deductions, it’s one of the largest tax expenditures in the tax code. My colleague, Jared Walczak, wrote a fantastic primer on the subject earlier this year, but I wanted to make a few key points, given the swirling conversations on the topic. The deduction disproportionately benefits high-income taxpayers. Only 30 percent of Americans itemize deductions on their tax returns, with only 28 percent of filers taking this specific deduction. The overwhelming majority of Americans do not take this deduction. Of those that claim the deduction, almost 90 percent of the deduction flows to those with incomes in excess of $100,000. The deduction favors high-income individuals who are concentrated in high-tax states. Six states—California, New York, New Jersey, Illinois, Texas, and Pennsylvania—claim more than half of the value of the deduction. But what is missed in that point is that those high-income individuals tend to be concentrated in and around large metropolitan areas. The distribution of the deduction is not monolithic within a state. In Pennsylvania, for instance, individuals claiming the deduction are centered in the Philadelphia suburbs. In Bucks County, about 40 miles north of Philadelphia, the average deduction is $5,444; it’s only $2,866 in Butler County, about 30 miles north of Pittsburgh. Proponents of keeping the deduction argue that eliminating the deduction hurts those below $200,000. First, as noted above, that statistic is a bit misleading, as almost 90 percent of the deduction flows to those making more than $100,000, but even more important is that the underlying analysis does not include the impact of lowering marginal tax rates. Below is an interactive map showing the mean deduction taken per tax return in each county. Click here for a larger version. Repealing SALT is not happening in a vacuum. It is offsetting revenues needed to finance other tax cuts.